No need for syrup here. 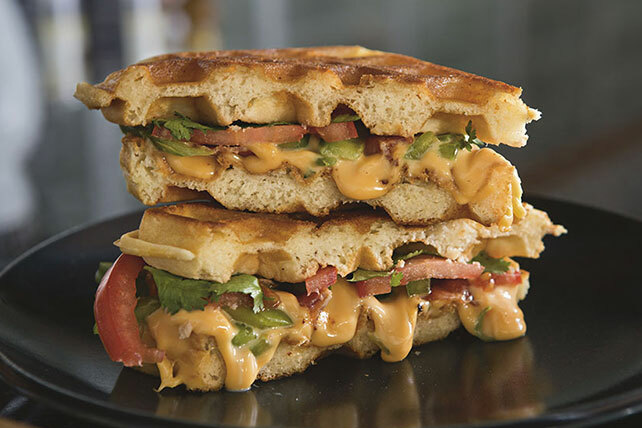 These grilled-cheese waffles sandwich a savory combination of peppers and bacon. Prepare waffle batter and use to prepare 12 waffles as directed on package. Heat large skillet on medium heat. Meanwhile, fill waffles with all remaining ingredients except butter to make 6 sandwiches. Spread outsides of sandwiches with butter. Add sandwiches, in batches, to skillet; cook 3 min. on each side or until Singles are melted and sandwiches are golden brown on both sides. Save 70 calories per serving by preparing with 12 frozen waffles. These sandwiches are a great way to turn an ordinary breakfast time into an extraordinary one. For an extra added kick of spice and heat, substitute 1 thinly sliced jalapeño pepper for the green pepper.